Moderated by Matt from 37signals. to get started, why don’t you guys each describe for our readers what you do. My work uses the Internet as a means of studying the human world. It’s one part anthropology, one part computer science, and one part visual art. Sometimes it’s tricky to describe what I do concisely. Last year I received an award from the National Science Foundation titled first place in “non-interactive media” It surprised me that the category was more well-defined by what it wasn’t than what it was. Sometimes it seems like that method of describing my work is more appropriate. I’m not a scientist, not a statistician, not a graphic designer, ... I suppose that makes me an Artist. well, I’m an Interaction Designer with a really strong interest in information visualization. My background is basically in Graphic Design and Architecture. I think the reason why infoviz is so interesting for me is because it gives me a little bit of every world, art, visual problem solving and engineering. Yes, I think the nature of this space is that it’s difficult to describe to people, as it blends many disciplines. If someone asks what you do, what do you show them? Though a little bit old and rusty, I think Newsmap would be the first thing I’ll throw out. Newsmap is a classic. I still hear people reference it all the time. Were you guys surprised when the sites you’ve mentioned gained such a large audience? Mostly what surprised me was the wide appeal. I never expected to create something of interest to the NSF, the Cartoon Network, and Art festivals. It’s funny. I find it can be hard to predict which projects will resonate with people and which won’t. Marcos and I talked about this in Barcelona last spring. It can require a "perfect storm" of factors, all happening at once. Good ideas have a lot to do with timing, and what’s happening in the world. Yeah, it’s funny trying to watch big companies try to manufacture something viral. Seems like so much of it is chance and timing. 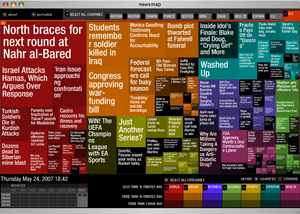 For instance, Newsmap came out at a time when RSS wasn’t widespread, so the idea of repurposing news information was really novel. thanks, yeah, the time I put newsmap out there, around 3-4 years ago now, there was probably not a lot going on in the ‘mash up’ world I guess. You could surf the web for tons of research papers. In many ways, projects like Newsmap help to prod along the rest of the industry, showing them a vision of what’s about to happen widely. exactly. Not even google news was giving out their content in RSS, so I had to resort to screen scraping. 4 years later, I’m still eating googlenews html to produce that viz. I see the role of people like me, Marcos and Aaron to continue to put out these ideas that are just ahead of what everyone is doing, but which are largely inevitable. Then we move on, and make something else. And the world catches up. well, Jonathan you’ve done a ton of work since then. I’m really impressed at how productive you’ve managed to stay during the years! Timing is essential. Look how the Beatles changed musically throughout their career. Their music was always just ahead of — but not too far ahead of — everything else that was happening in music. Thanks. I just stay curious. I remember seeing newsmap for the first time. It definitely stuck a chord with me. It was such a clear example of how much more information could be conveyed visually on the web. I think one thing that Newsmap demonstrates, which is important, is the fractal qualities of good design. For instance, you can glance at the grid and instantly see the largest stories overall, and the relative importance of sport vs. business, but then you can move closer and see the individual stories that compose the grid. Those orders of scale are important. What are you seeing now that you think will take others time to catch up to? What I see is an enormous amount of humanity on the web. The humanity is hiding in data. 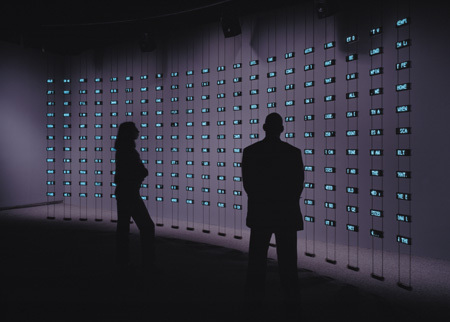 I don’t think enough people have been able to bring data to life, both visually and empathetically. What I find interesting is applying the principles of a piece like Newsmap — the fractal qualities — to all of the human world. What are its great stories? What are its patterns? But also, what are the individual experiences that compose those patterns? I completely agree… I think there are several major emerging trends that we are only beginning to understand the future of. One is what Jeff Howe calls crowdsourcing, using the power of the masses to tackle tasks. Jonathan, your attitude reminds of an idea i’ve seen attributed to michelangelo: the sculpture is already in the stone, he just takes away the parts that don’t belong. In this case: The humanity and interesting data is on the web, it just needs help getting displayed properly. That’s right, Matt. But it’s not as simple as carving stone, in the sense that the data is not hiding in its finished state. It needs to be rearranged, analyzed, brought to life. 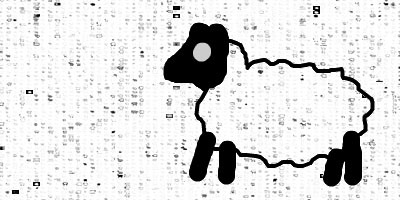 Thanks Jonathan… that was exactly my hope in creating The Sheep Market… to express the individuals within the vast dataset. Lovely blending of the online and the offline. This is another big trend I see coming. The dissipation of the boundary between online lives and offline lives. It’s all just life. Lived by the same people. We leave digital footprints just as we leave footprints in the mud. Where do you get your inspiration from? Where does the idea for something like Newsmap, We Feel Fine, or Flight Patterns come from? My inspiration comes from really simple questions I ask myself about the world. Like, I wonder if men or women feel heartbroken more often? And then I try to think about ways I can use data to find an answer (turns out women feel heartbroken three times more than men). Right now I’m working on a book about We Feel Fine, titled "The Encyclopedia of Human Emotion", and it’ll be full of observations like that. JH: I wonder if women are just three times more likely to outwardly communicate their heartbrokenness. maybe both genders feel it the same amount but one expresses it more. Good point. That’s certainly possible. And that’s something that must be understood when working with the web—the medium doesn’t yet reflect the "human world" at large. Usually it comes from different sources. Newsmap was definitively a need that I had. I’m originally from Argentina so my first language is spanish. I learned english when I was in school there and later japanese when I moved to tokyo around 9 years ago. I’m really interested in understanding other people’s points of views, and I remember spending very long hours going to international online newsmapers to read about the same story being reported from different backgrounds. when google news came out I was dazzled. It was not just a news aggregator, but it was a smart one, it’d group stories into clusters whenever it realized several newsmapers where talking about the same story. It was still not enough for me, as I later found myself clicking through the whole aggregator and its international sections to understand what was happening. I have to give credit where it’s due. 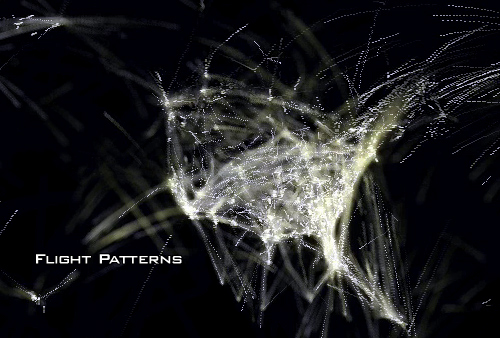 For Flight Patterns it came from extremely interesting dialog with my collegues at UCLA Scott Hessels, Gabriel Dunne and Mark Hansen. Their interest in man-made infrastructures intrigued me to really dig into the data. Much of my inspiration has come from great conversations with amazing minds. There is so much data in the world though,... I’m constantly seeing things that I’d love to play with. Aaron, funny you should mention Mark Hansen—his piece, Listening Post, was a huge inspiration for me (and for We Feel Fine). Still remains my favorite artwork I’ve seen. Basecamp wrote this on Jun 05 2007 There are 7 comments. Lots of interesting work here. It does seem though that the attitude in approaching it is definitely a contrast with the 37signals “getting real” concept. Has anyone else been able to get the We Feel Fine flash app to load? It looks like it’s a Java applet and not flash. Still not loading for me. I love Weskamps work. Great guy. yea I can get the We Feel Fine. It is freaking amazing. I am using safari by the way. Should also work with other browsers.